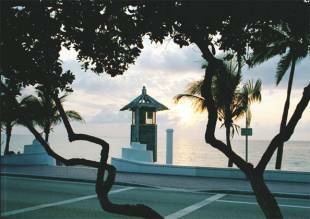 Excluding the life guard stations, we staked-out every component of the Fort Lauderdale Beach Revitalization for construction: the roadways, sidewalks, signs, trees, shower bollards, and the wall, with its distinctive and widely recognized spiral conch shell curls. � Pompano Business Center Parcels- J, M, P and Q. Copyright 2006� Douglass Leavy & Associates, Inc. All rights reserved.